For those who don't know, the Ulfberht sword was a Viking weapon of the finest quality, made with exquisite skill from the best materials available. They were produced between 800 and 1000 CE in Scandanavia. The swords were called "Ulfberht" because of a sort of trademark inscription on the blade. Genuine Ulfberhts are distinguished from impostors in part by the way the inscription is written. A real Ulfberht blade says "+VLFBERH+T", while imitators say "+VLFBERHT+". The difference between the two is more significant than just the spelling. Real Ulfberhts are made of an extremely high quality, high carbon steel, and contain very few impurities. The knock offs are made with inferior steel, with less carbon and more impurities. NARRATOR: From about 800 B.C., 'til today, humans have made weapons from steel. The process starts with iron, which is found in the ground as ore. The crushed ore is heated to separate the iron from the rock. But, on its own, iron is too soft to yield a strong weapon. The trick is to add carbon, most commonly from coal or charcoal. This hardens the metal and turns it into steel. 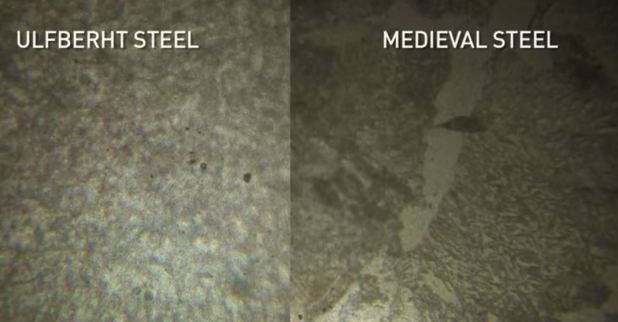 But not all steels are created equal..
ALAN WILLIAMS1: Medieval iron is both soft and brittle. This is a sample of a sword of modest quality. These long inclusions—perhaps looking a bit like sausages—these are inclusions of slag, the non-metallic part of the ore which has never been separated from the iron. The slag makes the iron brittle, which doesn't, actually, give you a terribly good sword. RICHARD FURRER: The biggest mystery is where did they get this raw material? We have no archaeological evidence of any crucible steel production in Europe until 800 years later... The Vikings didn't invent crucible steel. In fact, there's no evidence that anyone in Europe knew how to make it until the industrial revolution in the 18th century. But for more than 500 years before the Ulfberht, warriors elsewhere had been fighting with crucible steel weapons. 1 Alan Williams is a Conservationist of historical weaponry and an Archaeometallurgist at the Wallace Collection in London. How many genuine +VLFBERH+T swords are believed to be still extant, and what does the example in the best condition look like? *Note: You may earn a small bounty if you also say how many contemporary forgeries are still extant. TL;DR: We don't know, but at least ~170 swords bearing - in whole or in part - some variation of "VLFBERHT" are known to exist. The number of extant sword blades with the signature Vlfberht is not known... Probably the most extensive search project has been undertaken by the Norwegian-Russian Sword Project in 1992, headed by the Museum of Natural History and Archaeology in Trondheim, Norway and sponsored by the Norwegian Research Council. The project will be published by A.N.Kirpičnikov and Anne Stalsberg. During the project period A. N. Kirpičnikov examined 111 blades in the archaeological university museums in Trondheim, Oslo and Bergen. Out of these 111 blades 98 were well enough preserved to be documented by X-ray photographs, drawings and descriptions, and Vlfberht signatures were found on 30 blades; 18 of them were previously unknown, which increased the number of Vlfberht blades found in Norway to 44. The unpublished material is included in the find list of the present study. More Vlfberht blades will undoubtedly be unearthed in the future. For this study it was possible to collect information about 166 blades found in 23 European countries. The available published information varies from a sword only being mentioned by a competent archaeologist to fully examined and scholarly published swords. Since then I have learnt about a few more Vlfberht blades, mainly unpublished (a couple in the university museum in Trondheim; one from England; one from Czech Republic; one published from Poland with the signature variant I, reverse variant I). These have not been included into this study, but the 166 swords included are sufficient for this more or less preliminary study. To check all found blades for inscriptions is an enormous task; in Norway alone at least two and a half thousand double edged blades have to be examined. A.N. Kirpičnikov’s findings in Norway clearly indicate that there may also be a considerable number of blades with a variety of marks, but without signatures: 30 of the 98 documented blades have marks of the same type as the reverse marks of Vlfberht blades, and 20 of the 98 have different, but mostly geometric signs welded into the blade. This indicates that geometrical and other marks were frequently welded into sword blades which have no signature, and it demonstrates that the technique of welding rods into the blade to make marks and signatures was known in many countries in Europe, This is a point to be kept in mind when discussing the question if Vlfberht blades or signatures may have been copied or falsified. The typology of the variants on Fig. 2 is based on 135 Vlfberht signatures and 99 reverse marks, which are well enough documented in publications and by A.N. Kirpičnikov’s mainly unpublished drawings from the Norwegian-Russian Sword Project. The numbers of signatures and reverse marks in each variant are given brackets. The numbers are not exact for all signature variants, since not all signatures are clearly enough visible or preserved to be read and included in one of the defined groups of variants. 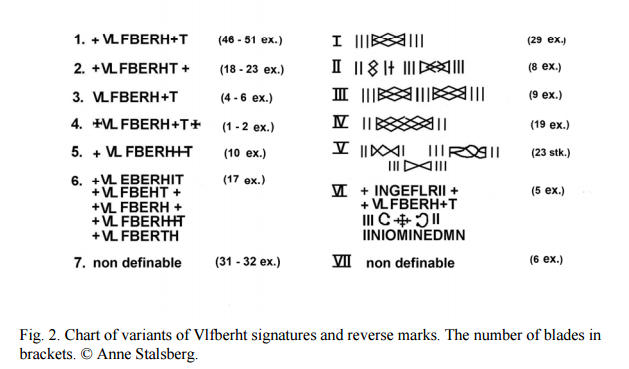 Seven variants of both signatures and reverse marks may give the impression of a great variety of signatures, but when one takes into regard the number of blades in the different variants**, it is clear that there are in reality only two main variants of Vlfberht signatures, namely variant 1 with 46-51 blades, and variant 2 with 19-22 blades, the only difference between them being the location of the second cross**. It may be, that variant 5 with 10 blades should be included into variant 1, since the sequence of letters and crosses is the same. I separated the variant 5 signatures where the and the <+> do not seem to be made as separate signs, but the horizontal rods in and <+> are made with one horizontal rod, and not one separate for the and > <+>, that is a simplified way of forging. The signature variants 3 and 4 are more like exceptions, and variant 6 consists of 6 unique variants. Variant 7 consists of signatures which are badly preserved or the blades too corroded to allow deciding how the signatures were "written", and therefore could not be included in one of the defined variants. On the distribution maps the find locations are marked within the boundaries of the modern states, for two reasons: the exact find locations are not known for all blades, and this way of mapping shows at a glance the distribution of the blades. This is sufficient for this study. Map 1 shows the general distribution of the 166 Vlfberht blades about which I have found reliable information. The few more which have come to my knowledge too late to be integrated into this paper do not alter the way of thinking in this paper, and probably do not change the main trends in the find material. The number of blades found in the Frankish Realm, Vlfberht's homeland (Belgium, France, western Germany, Italy, the Netherlands, Spain, Switzerland) is surprisingly small, a total of 16-19 blades, compared to 144-147 from pagan Europe plus 4 from Christian England. This ratio is observed throughout the Viking Age. It is especially improbable that Norway with a small population should have had so many more Vlfberht blades than the Franks themselves. Two factors greatly affect the distribution of the 11 swords: find circumstances and present research activity. A large part of the blades from pagan Europe comes from graves equipped with grave goods, while the blades from the Frankish Realm all come from rivers, or are single finds whose find circumstances are not known. Grave goods were not supposed to be given in Christian countries. The large number of swords found in Norway is the result of an especially generous burials rites. In Norwegian museums there are at least two and a half thousand double-edged swords and some six-seven hundred single-edged swords from the Viking Age. Modern research activity also influences the number of known Vlfberht blades, since more Vlfberht blades have been discovered each time the blades were examined for inlays. Especially two archaeologists have been active: A.N.Kirpičnikov examined a large number of blades in Norway, Sweden, and Old Rus’ (in Russia and Ukraine). Jorma Leppäaho did the same in Finland. But, all the same, the distribution reflects one indisputable reality: there must have been many swords during the Viking Age where many swords have been discovered. Early Viking Age; sword blades with their main existence in the 9th century. Middle Viking Age; swords with their main existence in the 10th century. Late Viking Age; swords with their main existence in first half of the 10th century - 11th century. 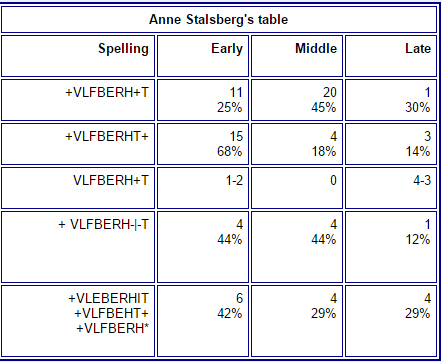 Anne Stalsberg distinguishes between 7 spelling variants (including "non-definable") for the Ulfberht signature and the backside symbols but doesn't tie that to blade quality. The table below with only 5 variants does not include the "non-definables" and a group with only 2 undatable specimens. Anne's time ranges are a tad unclear in the middle but the general time sequence is clear. Group A: Swords with their maker’s name spelt: +VLFBERH+T Out of these 14 swords, nine are made of hypereutectoid steels, and a tenth may also have been. The others are all made of eutectoid steels, which might of course have come from a steel hypereutectoid in other places. So all 14 could have been made from a crucible steel, whatever the source of that might have been. Group B: Swords with their maker’s name spelt the same way, but with the second cross in a different position: +VLFBERHT+ Out of these five swords, three were fully hardened and a fourth partly hardened. Three of the hardened 4 have only their edges made of steel, and although it is not possible to know what the bodies of the others were made of, it seems probable that they were all made the same way. Swords with their maker’s name as a variant spelling show more diverse microstructures. Group C: These 14 are made of medium-carbon steel, at least in their edges. 6 had Steel edges hardened by quenching, including an unsuccessful attempt at quenching. A further 8 swords had Steel edges, but were not quenched. Group D: Swords largely made of iron, or low-carbon steel. These 11 swords were of the lowest metallurgical quality, and also generally show the greatest variations in spellings. 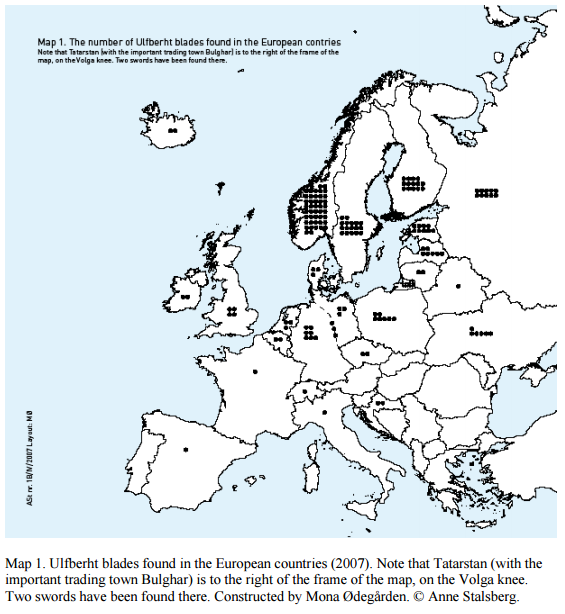 The original maker of the «Ulfberht» swords was evidently a craftsman (or perhaps a craftsman/merchant) who had access to a source of high-carbon steel. This may well have been ingots of crucible steel imported from the Middle East via the River Volga. In which case, his location was probably in the Baltic area, where this trade route terminated, and where most of these swords have been found. Such a high-carbon steel would have needed to have been forged, counter-intuitively, at a lower temperature than customary. If forged at the correct temperature and for the correct time, the swords produced would have been both hard and tough, and would have been highly valued. So it is not surprising that many other swordsmiths tried to copy these swords, and also copy their maker’s inscription. One workshop, who made their swords with hardened steel edges, copied the spelling exactly, except for placing the terminal + in the wrong place. Other workshops, made swords of differing quality, and differing accuracy of spelling. Blade made from (one?) piece of hypereutectoid steel, i.e. the carbon concentration is larger than 0.8 %. Blade made from eutectoid steel (carbon concentration about 0.8 %). Hardened steel (around 0.4 % carbon) for the edges with a softer core. Unhardened steel (around 0.4 % carbon) for the edges with a (wrought) iron core. Wrought iron (less that 0.2 % carbon) throughout. 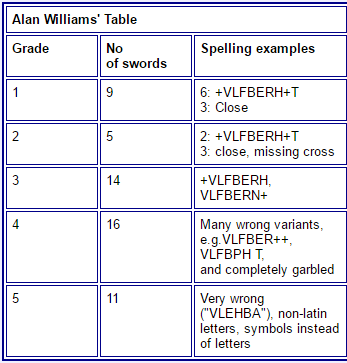 And as Williams shows above, in 55 VLFBERHT swords, accuracy in spelling (i.e., +VLFBERH+T) is positively correlated with the quality of the blade; the swords inscribed +VLFBERH+T are the highest quality, and the swords whose inscriptions deviated most from this spelling were also the lowest quality. Not the answer you're looking for? Browse other questions tagged middle-ages weapons vikings sword metallurgy or ask your own question. How much did a good sword cost in Medieval Western Europe?